While the country has been debating when will Jacob Zuma will go, Parliament’s Rules Committee has been hard at work making sure the impeachment option is ready if it’s needed. While most members were on holiday, this committee showed what can be done when it is urgent. Is impeachment going to work as a fall-back option if needed? By MIKE LAW. Amid the hype about whether or not Zuma will jump or be pushed, it is worth considering the prospect of impeachment and reminding ourselves that there is another option in reserve. Well before Parliament officially got under way this year, a small spattering of MPs could be seen wandering the corridors looking is if their holiday had been cut a few days short. But some things just cannot wait. On 29 December 2017, the Constitutional Court ordered the National Assembly to make rules regulating the procedure for the impeachment of a president “without delay”. The National Assembly is doing just that. It may have been recess or at least constituency time for members, but a subcommittee of the National Assembly’s Rules Committee was hard at work within two weeks following the ConCourt ruling. This came about after opposition parties the EFF, DA, COPE and the UDM approached the ConCourt, arguing that Parliament had failed in its constitutional obligation to enact rules governing a motion brought in terms of Section 89 of the Constitution. Unlike a motion of no confidence, which is essentially a political tool to remove a President who has lost the support of a majority of the National Assembly, the Section 89 procedure is more of a legal determination. It provides for the removal of the president on a series of grounds including: a) a serious violation of the Constitution or law, b) serious misconduct or c) inability to perform the functions of office. What is commonly known as the “impeachment” of a president in South Africa refers to the Section 89 process. Unlike a motion of no confidence which requires only the support of a majority of the National Assembly, impeachment requires a higher threshold: two-thirds of the National Assembly must support an impeachment motion for it to be successful. The impeachment procedure in South Africa, however, is unique, which created several issues for the Rules subcommittee. The first concern was the meaning of the word “serious” in the phrase “serious violation of the Constitution” and “serious misconduct”. What sort of violation of the Constitution by the president can be considered not “serious”, and what factors must be present for such a violation to meet this threshold? The second issue was how and who makes the determination of whether the president has been guilty of serious misconduct or a serious violation of the Constitution or law. The grounds for impeachment are couched in distinctly legal terms, begging the question: is this a political determination or a legal one? The third issue, however, was subject to the most intensive debate. The majority judgment in the Constitutional Court makes one thing abundantly clear: a valid motion to impeach the president, grounded in sufficient facts which present a clear prima facie case for impeachment, should not be able to be defeated by the ruling party by simply imposing its majority to protect a president who has seriously violated the Constitution or is guilty of serious misconduct. After three sittings of the Rules subcommittee, a proposal was reached on a set of draft rules which were presented to the Rules Committee last week. This has been a rapid and fruitful process and the draft rules agreed upon provide the answers to the tricky questions posed above. The draft rules define “misconduct” as “unacceptable, improper or unprofessional behaviour by the president”. They define “serious” as “an intentional, malicious or reckless act or omission performed by the president”. The word “reckless” in the definition of “serious” encompasses gross negligence by the president. While these definitions are admittedly somewhat vague, they do serve to clarify certain concerns raised. To determine whether these criteria are met, a three-stage process was envisaged. Stages one and three are fairly straightforward. It is the second stage that is more nuanced. The first stage is the initiation of the motion in the National Assembly. The third and final stage is a vote on the motion in the National Assembly, which requires a two-thirds majority threshold. Between these two fairly straightforward processes comes a more complex stage two. At this stage, the matter will be referred to another body, which will make a determination as to whether there is prima facie evidence that one of the listed grounds exists. That body will then make a recommendation as to whether the impeachment process should go ahead or not. That recommendation will be taken to the National Assembly, which will then vote by a simple majority to decide whether to adopt the recommendation of that body. This gave rise to substantial and contentious debate on the question of who will comprise this body that makes the initial determination of whether a prima facie case exists, as well as the binding force of that recommendation. Three options emerged. The first was that a panel of legal experts (the idea put forward was a panel of retired Constitutional Court justices) should make this determination. The second option was that the determination should be made by an ad-hoc committee of Parliament. The third was a hybrid option requiring an ad hoc committee to make the determination while being advised by a panel of legal experts. The argument for the panel of legal experts is that the initial stage requires a legal determination where complex legal questions are raised. It was vehemently argued by the EFF that such a panel would put paid to the opportunity for the will of the majority to defeat an otherwise valid motion. The argument against such panel was that it would amount to Parliament abdicating its constitutional duty to hold the president to account as well as the concern that such a panel has no authority to subpoena witnesses and other evidence for what is a parliamentary procedure. Ultimately, all but the EFF agreed to the hybrid model. There are two safeguards against the majority defeating an otherwise competent motion. The first is the electoral damage that the ruling party may suffer. As ANC Chief Whip, Jackson Mthembu, articulated in the Rules Committee sitting on Thursday last week, “a party that dismisses the recommendation of that expert panel is a party who wants to lose the election”. The second is that if Parliament dismisses the recommendation on what are considered arbitrary grounds, that decision is then subject to judicial review on the principle of legality which states that all exercises of public power must be rational. DA Chief Whip John Steenhuisen warned that if the National Assembly were to reject the recommendation simply by the majority wanting to protect an objectively rogue president, that decision would be taken on judicial review. There are still concerns about the Draft Rules and whether the Rules Committee’s decision complies with the Constitutional Court’s judgment. The first question stems from the fact that the ConCourt warned that an ad hoc committee process would be inappropriate for this procedure. The second is how the panel of experts will be composed and what will be the relative strength of each party in determining who will serve on it. The third is that despite the safeguards mentioned above, the opportunity still exists for the motion to be unjustifiably defeated by the will of the majority – exactly what was warned against by the Constitutional Court. 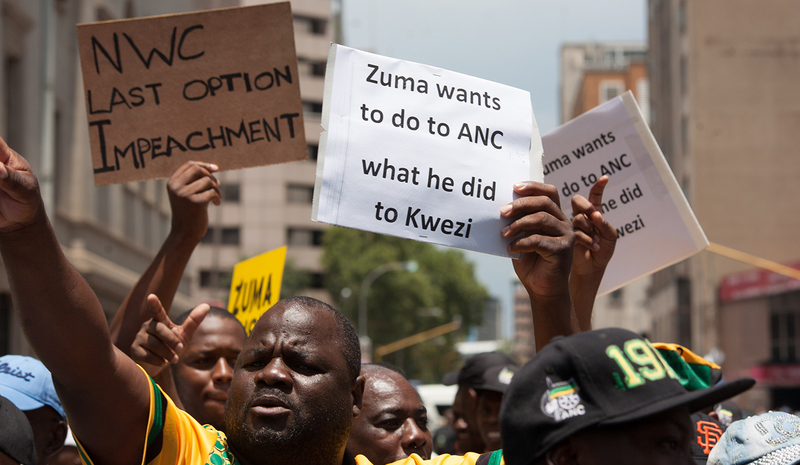 In the writer’s opinion, it is hard to imagine a successful impeachment process in South Africa. The reason is that it remains a simple numbers game. For an impeachment motion ultimately to succeed, it must be supported by two-thirds of the National Assembly. If the ruling party is of the belief that the requisite support exists for an impeachment motion, it is likely to follow the far less politically damaging motion of a no confidence procedure. The impeachment procedure stands to be a long process, with a full inquiry which will be open to the public and that could potentially illicit an array of damaging evidence of improper government dealings. Mike Law is a political analyst and political/legal researcher holding an LLB and LLM from the University of Cape Town.